Marriage can be a tricky and hard road sometimes. Being a wife can be hard too. If you are like most women, nobody taught you how marriage works or how to be a wife. We kinda go into it blindly, stumbling every step o the way. Sometimes things are good, and it often feels like a lot of times things are not-so-good. We can become discouraged and feel hopeless. We just need a solution. Some way to make things better. When we feel like we’ve tried everything and it’s still not getting better, don’t give up. There is still something else you can do if you haven’t done it yet. Pray for him. We can’t always fix everything ourselves, even though we think we can. And even, sometimes we make things worse. We try to solve the problem by trying to change the circumstances or change our husbands. It doesn’t work! We, as wives, are not meant to change our husbands. It’s not our job. Besides, we’re not very good at it. I’ve yet to meet a wife that changed her husband and they have a wonderful marriage. It just doesn’t happen. So, when things are not getting fixed or better, we get really discouraged, mad and lost. We feel heavy like we are try to carry our marriage ourselves, by ourselves. We carry the burden of all that is wrong. We carry the burden of a relationship going bad. Did you know that we are not supposed to carry any burdens? God wants us to give those worries, cares and burdens up to Him to shoulder. He’s much stronger and honestly…better at it than we are. The only way for you to get rid of the burdens and get help in your marriage is to give it up to God. To pray about your marriage, about your husband. Praying for your husband isn’t only for him but for you too. Not only are you asking God to help him, but you are getting help for you too. You are not meant to carry all of life’s burdens. Just as we do, our husbands have a hard job. They have a hard task of leading our families in today’s society, which is not easy I imagine. They are constantly being bombarded by family, the media, work, and more. Often the things they are being attacked for is their manhood, their confidence, their relationships… pretty much their very soul! A reason your marriage may be going downhill is because he is having a hard time processing life and his responsibilities. His job may be stressful and he is retaliating any way he can to gain some kind of control of his life. Just like us, no one taught them how to be a husband and be married. Our husbands need care and love. They need someone on their side. They need us to pray for them. We may be the only person in the whole world praying for them. Think on that… what if no one else is praying for him? As soon as you pray, answers will come. They may not always be the answers you are wanting. The solution is probably not your ideal plan. So don’t expect to pray and hear what you want to hear, what you are expecting should happen. If your plan and your solution was the answer, then you wouldn’t be having any challenges in your marriage. God’s plan will be better, it will be perfect. When you pray, you need to have faith that your prayers, as long as it’s in God’s will for your husband’s life, not your will for his life, will be answered, in God’s time. Having faith means believing and trusting God that He will answer your prayers. Prayer combined with faith and no doubt, means you will receive it (Matthew 21:21-22). It may seem impossible for this to be true, but then you are not trusting, believing and having faith in God and in praying. It could be that you have prayed in the past and didn’t see the results right away. Although God promises us the desires of our heart (Psalm 37:4), He doesn’t say that faith is a magic wand and as soon as your done praying, boom, there is your request. Some things take time. 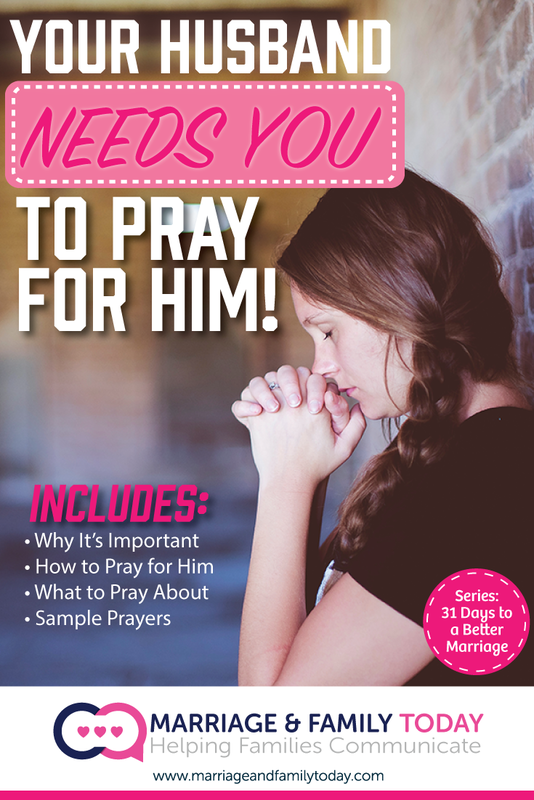 Even if you’ve been hurt by your spouse you are to pray for him anyways (Luke 6:28). That may not be an easy task, especially if you are very angry at him. It can be tough to do something good or think good thoughts about someone that has just done you wrong. Not only should you pray for him, but you should bless him too! That means be nice. Serve him. Help him. Do things for him that you wouldn’t normally do, with a cheerful and loving heart! Find your “prayer closet.” When you pray, go off by yourself in a quiet place. You want to take your prayers before God in private. (Matthew 6:6) Many times in scripture people go off by themselves to pray and talk to God. Jesus is a prime example of this. He almost always went off alone to pray. It says in the Bible to take your prayers before God and not in front of others. Praying is not a time to show-off, or show others that you actually pray. You don’t want a “good-job” reward from them, because that’s all you will get. Wouldn’t you rather be rewarded from God? Any maybe you don’t want your husband hearing you pray for him. He could take offense at what you’re praying about. Or he may try to take it in his own hands to work on what you are praying about instead of letting God do a work in him. God is much better at working on us instead of us trying to make things work. I pray for my husband’s relationship with God. I pray that God would bless my husband. I pray for my husband to be a spiritual leader for our family. I pray for my husband to have a heart for his children. I pray for my husband to make wise choices. I pray for my husband’s emotional, mental and physical health. I pray for my husband to prosper at work. I pray for my husband’s power to resist sexual temptation. I pray that I will show my husband respect, grace and kindness.